The 19 stainless steel statues were sculpted by Frank Gaylord of Barre, VT and cast by Tallix Foundries of Beacon, NY. They are approximately seven feet tall and represent an ethnic cross section of America. The advance party has 14 Army, 3 Marine, 1 Navy and 1 Air Force members. The statues stand in patches of Juniper bushes and are separated by polished granite strips, which give a semblance of order and symbolize the rice paddies of Korea. The troops wear ponchos covering their weapons and equipment. Click here for a description of the mural wall and statutes, including position in the formation, Service, Duty, Race and Weapon. I am very proud to have stepped up to the plate and served my "adopted" country. "Adopted," because I was born with duel citizenship. 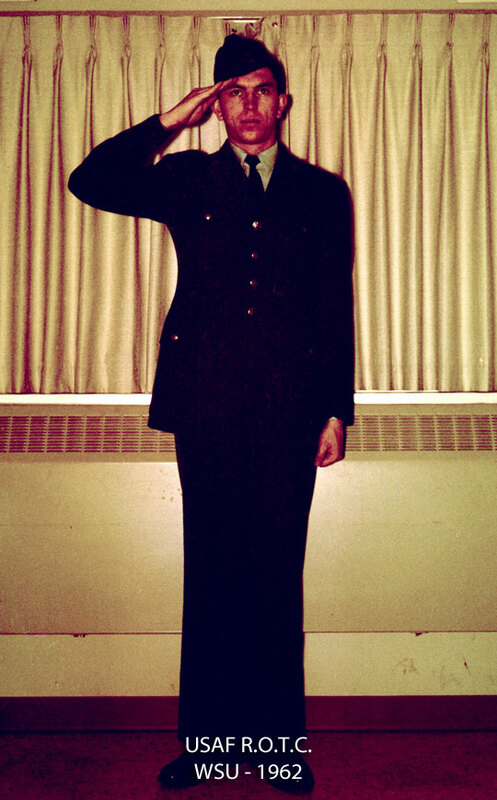 Like the president, with his "bone spurs," I could have avoided military service. It's my belief that serving one's country, no matter the time commitment, results in a "well rounded human being," for lack of a better description. You are exposed to mental and physical conditioning, learn the meaning of trust, commitment, honesty, and selfless connection to others. Throughout my "working years," I formed an opinion, that men and women who I either worked for as an employee, or worked with as an employer, were reliable, dedicated and professional. 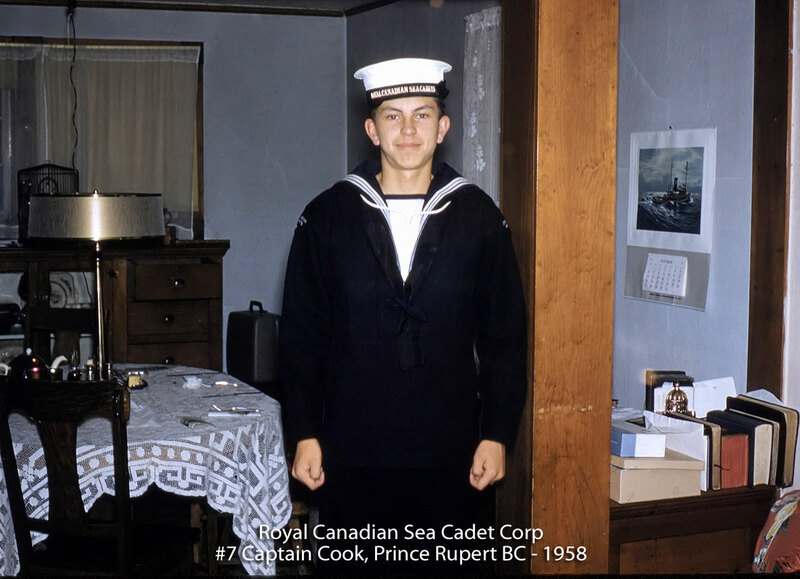 My first exposure to "military service" was as a Royal Canadian Sea Cadet (RCSC) back in the late 1950's when we lived in Prince Rupert. I was a mere lad of 14 when I joined Royal Canadian Sea Cadet Corps. (RCSCC) Captain Cook. The program was designed for kids aged 12 through 19. And I was gobsmacked to see the unit is still going strong more than a half century — 57 years later! It was a great introduction into the concepts of honor, responsibility, accountability, and team work. We learned the basics of seamanship — ropes, knots, basic navigation, and got to ride Navire canadien de Sa Majesté [NCSM]) corvettes like the HMCS St. Laurent when she visited Prince Rupert. I really enjoyed the experience! A notch up on my previous Cub Scout experiences, for sure! 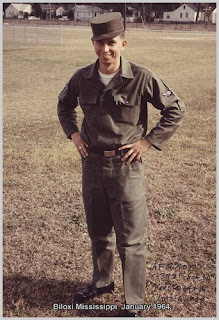 By and by, I found myself as a basic recruit at Lackland Air Force Base. 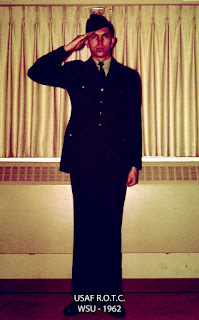 And it was a totally different experience from the youthful camaraderie of the Cub Scouts, RCSCC, and when you dazzled your college date in your ROTC (Rot-See) uniform. If you've served, you know what I am talking about! Pictured here is what our T.I. (Technical Instructor) referred to as a "trained killer." I found it hard to synchronize a Personnel Specialist as being a "trained killer," as the only time I fired an M-16 was to "qualify" in boot camp, and annual qualification at permanent duty station. Again, I really enjoyed my four year tour. Many fine friends and great adventures. • Armed Forces Day is always held on the third Saturday of May. The first Armed Forces Day was celebrated on Saturday, May 20, 1950. The day is designed to expand public understanding the role of the military. It was also a day to honor and acknowledge Americans in the armed forces through base open houses, parades, even air shows. Armed Forces Day marks the close of Armed Forces Week. ✔• Memorial Day, also held in May, is observed on the last Monday of May. Memorial Day — once known as "Declaration Day" — commemorates all men and women, who have died in military service for the United States. Memorial Day started as an event to honor Union soldiers, who had died during the American Civil War. It was inspired by the way people in the Southern states honored their dead. 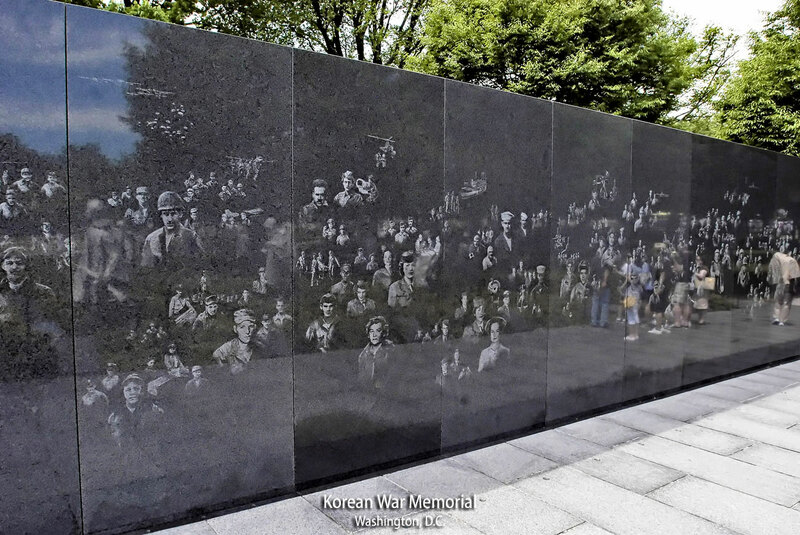 After World War I, it was extended to include all men and women, who died in any war or military action. Many people visit cemeteries and memorials on Memorial Day. Traditionally seen as the start of the summer season. • Veterans Day is always observed on November 11th, regardless of what day of the week it falls on. Veterans Day commemorates the signing of the Armistice officially ending World War I — not WWII — which was signed on the 11th hour of the 11th month, 1918. Originally known as Armistice Day, intended to honor veterans of World War I. 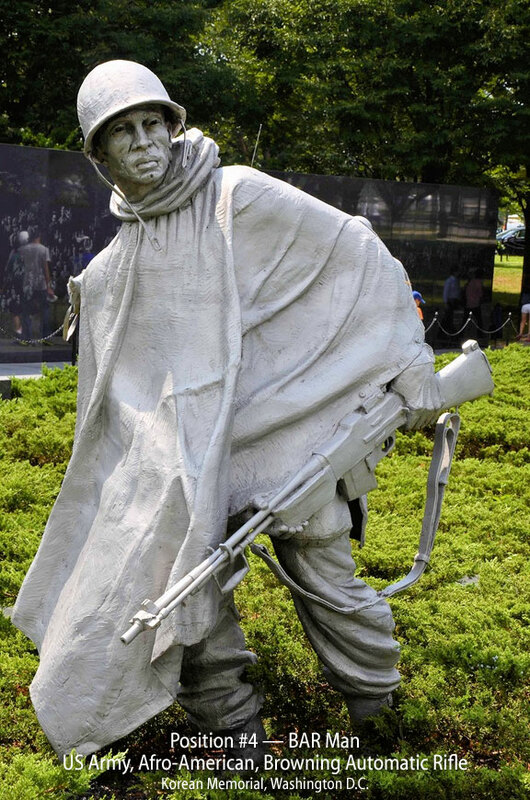 Later amendments to the law included World War II, the Korean war, and finally, to honor all veterans, regardless of conflict, which brought in veterans of Viet Nam. And is generally taken to be the last day of summer.